Congratulations and Super Hurrah to Sue and Tahirih! 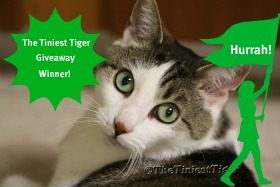 They won the signed copies of Jackson Galaxy’s Cat Daddy! Thank you to everyone that participated. 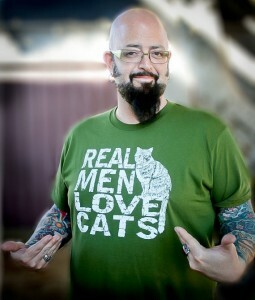 Happy Book Release to Jackson Galaxy! May 10, 2012 was the release day for Cat Daddy: What the World’s Most Incorrigible Cat Taught Me About Life, Love and Coming Clean, by Jackson Galaxy star of Animal Planet’s My Cat From Hell. Earlier this year, we talked tiger with Jackson about how his love for cats goes back to his youth when he was enamored of the big cats. Today, Jackson, a cat behaviorist opens up his life, heart and soul in his new book, the fulfillment of a promise Jackson made to Benny his cat, that he would tell his story. When we spoke with Jackson a few days ago, he hoped readers would obtain a better understanding of how their own cat sees the world and if the reader is not already sharing their home with a cat, that the book would motivate the reader to adopt one! Jackson credits Benny with saving his own life. connection to the pride of the lion? His love for the feline family stayed with him into adulthood and we agreed, that in our opinions, the wildness inside each and every cat is the reason for the fascination, admiration and attraction by humans towards the domestic felines that share their lives. Those that have feline family members sharing their home know that the feline-human bond is quite similar to the human-human bond, because the relationship is a connectedness that is based on love, respect, and compromise. Cats are intelligent and willful beings that refuse to be ruled. To successfully change what one thinks is a cat’s undesirable behavior, the human must first understand that a cat is just doing what a cat does, and that the compromise will need to come from the human. Jackson has learned from his 16 years in the cat psychology realm that in order to succeed in mending the relationships between cat parents and what is deemed a problem cat might be simple changes that cater to the cat’s need to be “wild”. The very thing that attracts humans to the cat, their wildness, is often what is also interpreted as a problem. Cats are hard-wired to hunt. They can’t control this instinct. Playful pouncing and stalking as a kitten is the preparation for survival as an adult. Cats that are part of a human family don’t need to hunt for food, but they still need to release energy and express themselves by activities that mimic the hunt.